Preheat oven to 425°F. In a pot, combine orange juice concentrate, soy sauce, vinegar, sugar and red pepper flakes. Heat until boiling. Set aside. In a large wok or skillet, heat coconut oil and vegetable oil to medium. Add beaten eggs to a large bowl. In another bowl, combine cornstarch, salt and pepper. Dip chicken pieces in egg mixture, then in cornstarch, twice, finishing with a cornstarch layer. Fry the battered chicken pieces in hot oil until golden brown. Transfer to a 9 x 9-inch baking dish. Drizzle sauce over chicken. Bake for 15-20 minutes, stirring every 5 minutes to coat. Serve over sticky rice, if desired. It is mid-afternoon and my kitchen is full of kiddos and food (I’m a mom and food photographer. So this happens daily. And they wait. Always, they are waiting. Those beautiful little tweens of mine. Even when they’re sitting there, drowing in Snapchat and science homework, they wait. And listen. So selfless. Not a hint of an ulterior motive. These humans of mine would rather eat takeout every night, over all of the home-cooked goodstuffs left over from hours of photoshooting. Except for tonight. Because I’m ready. I’m planned and I am prepared. 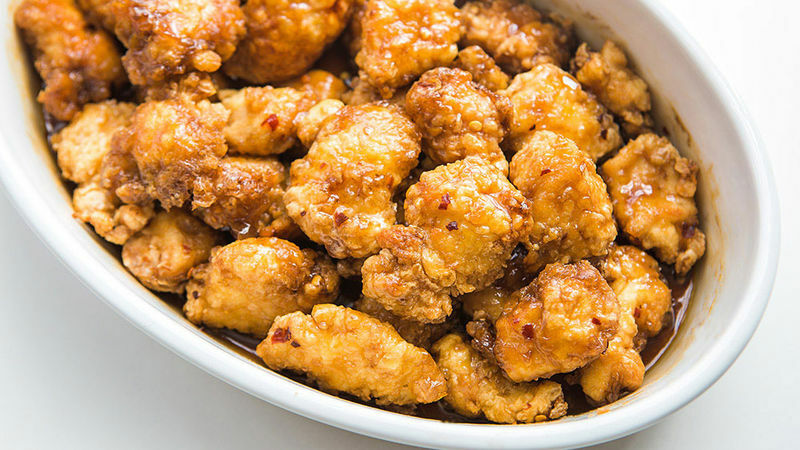 Because I’ve figured out how to make a homemade version of Panda Express™ orange chicken that is so exact, I think it’s going to change the trajectory of my kids’ after-school food begging for all time. Secret #1: The ingredient lineup. Everyone tends to turn to a flour coating when making deep-fried homemade stuffs. But thing is, the coating on eveyone’s kids’ favorite orange chicken is lighter and less dense than what you get when you fry with flour. So the secret is: cornstarch and egg. A little orange juice concentrate, a pinch of red pepper flakes, soy sauce and vinegar and lots of brown sugar. Drizzle atop the just-fried chicken, then bake until sticky and golden. And you’ll have a pan full of perfect sweet, slightly spicy, totally orange chicken-y orange chicken. And your life (and the life of any sneaky tweens in your house) will be rocked forever. Grab the chopsticks. Mama’s cooking dinner tonight!